Front Sight's Founder and Director, Dr. Ignatius Piazza understands that his offer may offend some school administrators and parents who do not see arming and training selected school staff members as a positive solution to violent attacks. However, he is quick to point out that historically, his approach has worked while gun control has actually increased violent crime by shifting the balance of power to favor the criminals and lunatics. "My offer is not a new idea," says Piazza. "In the early 70's, Israel was faced with much greater problems of armed terrorist attacks on schools. The cry for more gun control was heard then too, but Israel very carefully analyzed all possible options before adopting the proactive position of arming and training their teachers. School shootings stopped and terrorists looked for easier targets." He maintains that gun control never has and never will stop criminals and madmen from carrying out acts of gun violence. "In our country, every time a misguided individual on psychiatric drugs goes on a killing spree, anti-self defense legislators, watch the polls and exploit the dead victims in order to fool the public into accepting more gun control. able to set the example for the rest of the country to follow." Dave Clark, who has taught for the last 25 years at Junction Junior High School in Livermore, Calif., agrees with Front Sight's philosophy. In fact, Clark has previously attended a Four Day Defensive Handgun course at Front Sight at his own expense and found the course to be exactly what is needed to train fellow teachers to stop an attack similar to Santana High School. "Front Sight provides safe and responsible training to a level that exceeds law enforcement standards," says Clark. "Among the many lessons taught, I learned universally accepted rules in justifiable use of deadly force. More importantly, I learned when not to shoot and how to be more mentally prepared to see a lethal confrontation coming before it happens in order to avoid it. The firearms training is second to none and clearly gives the graduates the skill needed to save the lives of those in their charge if ever attacked. If my school district chose to adopt a policy of sending selected teachers to Front Sight for concealed handgun training, I would wholeheartedly support it and volunteer as a Safety Monitor. There is no reason for our children to continue to be victimized when free, professional training is available to stop school attacks." the scene too late to stop the killing." Not so convinced is Sharon Piazza, Dr. Piazza's aunt who is an elementary teacher and summer school administrator for Oak Grove School District in San Jose, Calif. "The thought of teachers carrying guns saddens me greatly. I would feel that we had failed as a society and missed the core reason why violence is occurring in our youth. It is not guns, but something much deeper that is the common thread in all these tragedies. If we must arm individuals in the school setting to protect our children, I definitely believe they need to be trained in when and how to use the weapon. However, I am definitely not one who would want to be armed and would not want to teach in that setting." Another obstacle to Front Sight's offer to train and arm teachers is the current law in many states prohibiting the possession of firearms on school grounds even when the possessor is qualified and has a concealed weapons license. Dr. Piazza quickly points out that those laws did not prevent or stop the gun violence at Santana High. He states, "The recent attacks in schools indicate criminals have concluded that 'Gun Free School Zone' actually means 'Government Certified, Helpless and Unarmed Victim Zone.' School administrators, law enforcement agencies, and legislators can change those laws and policies if they truly want to stop the attacks. Most districts cannot afford to have even one full time police officer in every school, but they can easily afford to train three or more of their selected staff members to a higher level of firearms training than offered in police academies because Front Sight will provide the training free." Retired law enforcement firearms instructor, Mike Waidelich from Bakersfield, Calif., strongly supports the Front Sight concept of arming and training teachers. "Nearly every tragedy on or off school grounds in the entire 30 years of my law enforcement career could have been prevented or the damage done considerably limited, by the presence of an armed and trained individual. Had the teachers at Santana been properly trained and gone for their guns, the death and injury toll could have been considerably reduced. The training provided in Front Sight's basic training classes easily exceeds the training provided in most police basic training academies." Piazza adds, "Teachers will be trained to carry a concealed weapon, so potential attackers will not know which teachers are armed and which are not. In states that have adopted concealed weapon laws for private citizens, violent crime has dropped. School attacks will drop as well once it is known that any of the teachers and staff members on school grounds have the ability and training to stop a violent attack immediately." Piazza explains that scientific research also supports Front Sight's stance on concealed weapon training. He references researcher, John Lott, Jr. from the University of Chicago School of Law who published Crime, Deterrence and Right-to-Carry Concealed Handguns in July 1996. "Mr. Lott's research of cross-sectional time-series data from all 3054 U.S. counties from 1977 to 1992 found that allowing citizens to carry concealed weapons deters violent crime and appears to produce no increase in accidental deaths. If those states which did not have right-to-carry concealed handgun provisions had adopted them in 1992, approximately 1,570 murders, 4,177 rapes, and over 60,000 aggravated assaults would have been avoided yearly." Piazza asks, "How many times must we experience another Littleton, Colorado or Santana High School before we wake up, study the research and adopt policies which actually reduce crime and begin saving our children instead of leaving them helpless victims for the next drug user to snap?" Gun control typically increases violent crime yet some politicians continue to tout disarming law abiding citizens as a solution. Front Sight has a better solution. School districts interested in taking advantage of Front Sight's commitment to help protect our children should call 1-800-987-7719 or e-mail Front Sight at info@frontsight.com. 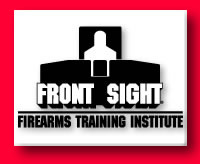 More information about training is available at http://www.frontsight.com/."